CIMES 2016 is a truly global machine tool trading and sourcing platform hosted in the world’s biggest machine tool market: China. As Asia’s leading machine tool exhibition for metal cutting tools and CNC machine trade, it also showcases the very latest high-end metalworking and industrial automation technology. One-piece construction has a number of advantages. The labor cost for assembly is eliminated, less machining time and fewer set ups. The integrity of the part is increased and the weight possibly reduced. Nordex Engineers are available to re-design or reverse engineer an assembly and make it cost effective and efficient. 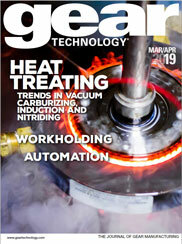 Enhance your atmosphere heat treatment operations with the latest industry innovations and technical resources. Take a close-up look at the inner-workings of the ATLAS batch atmosphere furnace line with the walkaround video, or read the technical article on enhancing your carburizing and quenching processes. Click here to access these resources.